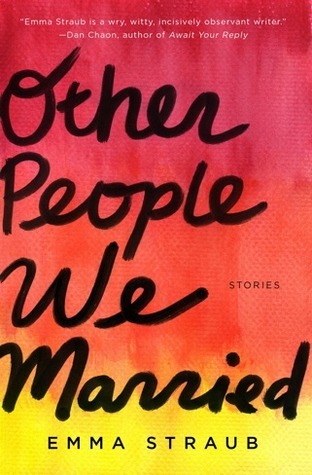 OTHER PEOPLE WE MARRIED is simply one of the best collections I have read in years. The twelve stories in this concise compilation recall the early work of Ann Beattie, Lorrie Moore (who offers a blurb) and Raymond Carver. The characters that inhabit these worlds are deliciously sad and wickedly funny, and their tales draw you in with an immediacy that is startling in a few short pages.Emma Straub knows where to start a story and when to get out, all the while leaving you wanting more. After tearing through this collection a couple of times and marking up my copy with post-its and scribbles in the margins, I’ll admit to a bit of a writer’s crush.A few e-mail exchanges later I was relieved to find that I managed not to scare Emma away with my enthusiasm, and was more than thrilled that Emma agreed to an interview for TNB. RA: Emma, writing a successful short story ultimately means you have to distill the very essence of plot and character in a few pages. I had a professor once tell me that I was a novelist trying to write short stories. You do not have this problem; each story in the collection is a study in finding that one moment of truth. Have you always found the short story form comfortable? ES: Thank you! In a funny way, I’ve always felt like I was a novelist trying to write short stories too, so I’m glad that I’ve fooled you into thinking that I know what I’m doing. It is true that, when writing stories, I do write towards that one moment, which is a lovely, very manageable feeling. I’m working on a novel right now, and it’s an entirely different beast. Now I think I must be a story writer trying to write a novel! I find a lot of the readers at TNB are interested in process, can you share yours? I am an outliner, to be sure, but not a terribly thorough one. I outline the big events—or, what I think will be the big events—and leave the scenes up in the air. So my outline changes with every draft. That process is true for both stories and novels. The novel I’m working on novel covers a very large expanse of time, so I’m trying to be especially good about that. Was it always your intention that the characters in these stories would live for only a few (stunning) pages? Is there any character you had a hard time leaving? (I vote for Jackie). Were there any surprises? Did you leave anything out of this collection? Well, Jackie and Franny used to belong to a novel, one that I have cannibalized and left for dead. I do sometimes feel sad that other people don’t get to find out about the rest of their lives, which I know very well. Maybe someday I will try to resurrect that book. I also miss Teddy and Richard, from “Hot Springs Eternal,” but I’m sure they’re very happy, wherever they are. I don’t think I know the characters very well before I start, but certainly before I’m done with a story. With the abandoned Franny novel, I got to know everyone in that universe very intimately, but yes, certainly there are surprises. I think if none of your characters surprise you, you’re holding the reigns too tight. Yes, there were stories that I took out, either because they felt redundant or because they felt too far afield. There will be another collection someday, I hope. When I write, if I have to track back to the genesis of the idea, it is usually an image that comes to me first, perhaps a snippet of dialogue. Talk a little about your process. I don’t know if I can’t properly identify what makes me write. I get inspired by all sorts of things, often taken from my own life, or the lives of people I know, or an article in the newspaper, or a painting, or a song, or a conversation I overhear. Then I take squirrelly little notes and sometimes an idea emerges. I have a very long list of stories and novels to write. I think if someone gave me five years with a live-in chef and a yoga instructor, I could very happily write five or six books. On the subject of your “squirrelly little notes” there was a recent post here at TNB discussing the volumes of paper and notebooks that make up a writer’s archive. I have never been one to journal – everything gets poured into the work – and my notes consist of post-its and cryptic scribbles in notebooks that only I understand. My “paper” legacy consists of proof pages from the publisher and stacks of stained and wrinkled notes. What does your archive consist of? I’ve always been a pack rat, so my archive will be PACKED. Slips of paper, maps, notes, first drafts, notes from early readers, letters, receipts, detritus. If anyone is ever interested in going through all my passed notes from high school, just let me know. You have a refreshing knack for dialogue and the ability to infuse even the most melancholic situation with humor. Often, the best humor on the page arises from the emotional content of the material and I suppose, it is the most personal way of conveying your author’s voice. What writers inspire you? There are a lot of writers I admire: Lorrie Moore, Jennifer Egan, Kate Christensen, Tom Perrotta, to name but a few. As for writers that make me want to be a better ME, though, I don’t know about that. Let’s just say they make me want to be a good writer and leave it at that. Otherwise, it might get a little creepy. Congratulations on the recent sale of your novel, I’m very excited to read it. Thank you! It is phenomenally exciting. As I mentioned earlier, I was writing novels before I started writing stories, and so it feels extremely validating to have finally sold one, and to a publisher I admire as much as Riverhead. As much as I love and support small presses, I am very much looking forward to having a bigger support team. An editor! A publicist! A marketing department! It boggles the mind. Do you remember the first time you really felt like a writer? I’ve always felt like a writer, always. I wrote books as a child, and poems as a teenager, and was very lucky to be surrounded by encouraging voices. Can you talk a little about publishing this collection with the brand new Five Chapters imprint and the wonderful Dave Daley? Sure! I published a story on Five Chapters a couple of years ago, and about a year ago, Dave Daley approached me about doing the collection. It was amazingly flattering that Dave wanted my book to be his first. Publishing with small presses has its advantages and drawbacks, but Five Chapters has been amazing. I get more attention than I would at a bigger house, that’s for sure. How difficult do you find marketing your work? While being on social media does take a lot of time, I don’t find it difficult at all. If anything, I enjoy it too much! Being at a small press, I certainly do rely on social media for much of my publicity. There is absolutely nothing I wouldn’t do! There are some writers who feel like it’s not their job to promote their work, but I’m not one of them. It’s all part of it, these days, and no one will ever care as much about my work as I do. I agree, self-marketing is the unspoken agreement we all make, whether published by a large or indie publisher. And with the advent of the Internet there isn’t much that is kept sacred. A current conversation raging on the boards has been about the critic on the Internet. Some authors have engaged these critics, while others turn the other cheek. Where do you stand on this? One should never respond to a critic. Never. It’s very simple. What would people be surprised to find out about Emma Straub? Oh, god. I tell people so many details about my personal life on the Internet that I doubt I could surprise anyone. Maybe how little I actually want to leave the house? Being a total hermit is my dream job. What’s on your nightstand right now? Are you a one book at a time girl? Or do you have a staggering TBR pile? Right now I’m reading Alan Heathcock’s VOLT, which is very dark and rich and good. Next up I’ve got some biographies of movie stars (Elizabeth Taylor, Katherine Hepburn, Judy Garland) that I’m reading for research. I also can’t wait to get my hands on Tina Fey’s BOSSYPANTS! I am going to gobble that up. To follow up my conversation with Emma, I asked Dave Daley of FiveChapters.com, and now a publisher, what inspired him to start an imprint. DD: FiveChapters Books started because the state of publishing provided an opportunity. FiveChapters.com was one of the early online literary magazines, and for five years now the site has serialized a new story every week. Some 275 stories are in the archives, and every week the site generates between 15,000 and 25,000 page views. That represents a lot of people who love short stories — and it seemed to me that if they trusted FC the same way I trusted indie-record labels or the Vintage contemporary label as a teenager, that the Internet provided a way to upend the big publishing model in a way that benefits writers. The costs for a small press are decidedly lower — and by trying to sell directly to readers, we can break even by selling far fewer books. Suddenly the barriers to entry disappeared, and I could really see a way to do something I’ve always wanted to try. The original plan was to begin with an anthology of FC stories, but the more people I talked to about the idea, the more submissions I started to receive. Lots of amazing writers had story collections available. As I realized I could work with people like Emma and Jess, (Jess Row, author of Nobody Ever Gets Lost, also by Five Chapters) the anthology moved to the back-burner for the moment. I’d had Emma on FC in 2009 with her story Puttanesca, and it was one of my favorites. She’s got talent to burn, on top of being the most ridiculously cool and generous person. When she sent me the manuscript, it was an immediate no-brainer. The voice, the humor, the spirit, the genuine humanity of her work — she’s going to have a long and amazing career. I’ve known Jess through FC and other projects for several years now, and it’s an honor to publish someone who I think is one of the most important writers of this time, someone with deep insight into the way the biggest questions of this moment affect individuals, relationships, neighbors. My hope is that this is the Paul Harding or Jaimy Gordon of 2011 — the small press book that gets noticed in a big way. Both Emma and Jess have sold their first novels to Riverhead and I couldn’t be more delighted — that’s the whole plan. You can order Emma’s book: Other People We Married along with Jess Row’s Nobody Ever Gets Lost from the Five Chapters website as well as purchase it from some very fine indie’s such as BookCourt and McNally Jackson among others. If you haven’t already, a visit to FiveChapters.com will inspire you with a daily short story fix like no other on the web. Bookmark it, you won’t be sorry. Enjoyable interview, Robin. Always good to get examples of good dialogue- an area in which I’d like to focus some personal development. So this is a particularly helpful review. I look forward to checking it out. Thanks, Joe. Dialogue is one of those things writers have a tendency to over think, I know I do…. maybe we should let the characters run at the mouth, just to see what happens instead of worrying about capturing that one perfect sentence. So what you’re saying is that words really do speak louder than actions? From your lovely poems I’d say you have the ear for dialogue, all those luscious words tumbling around and rearranged just so. I love the line from Sophie in your opening para! On this alone, I look forward to reading this. It’s a great title too, instantly intriguing. Great interview, Robin and Emma and Dave. It’s always good to get a peek inside other writers’ minds and this was no exception. This book has been on my radar for awhile now — the cover is really beautiful, isn’t it? — and now I want to read it more than ever. Nice job, Robin! I think the quality of Emma’s book and what Dave wants to do with the Five Chapters imprint is testament to the long life of the book — and by book I mean the physical hold in your hands and turn a page kind of book…. Ooh, I’ve been meaning to read this book for a little while and this interview definitely pushes me over the edge of wanting to read it into Goddamnit, I need to read this, where can I find a copy ASAP-snap-snap-now. Thanks for the great interview, Robin, both you and Emma were super smart, lovely, and fun. So glad this made you want to read Emma’s book! Aw, Tawni…. you ARE the best! GREAT interview, Robin. And that one sentence you put in there about Jews, adultery and modern dance being unseemly is so, so good that I WILL go out and get this book! The addition of “modern dance” in that sentence just blew me away, too! I love how one phrase can turn a sentence on its head and give you everything you need to know.